Charge The New York Times with Espionage? 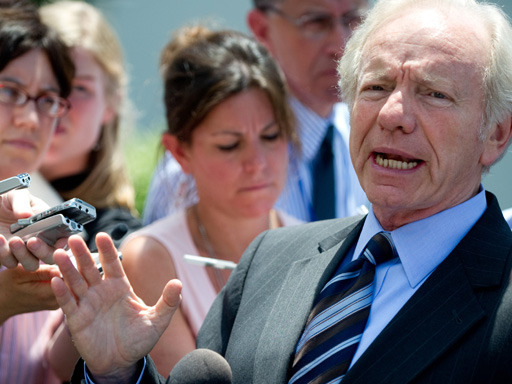 Sen. Lieberman Says, "Look Into It"
As the damage from leaked U.S. diplomatic cables spreads, so too does the pressure in Washington to do something about it. For now, it appears that the original leaker, the media organization WikiLeaks, will not go down easily. Although their leader, Julian Assange, is currently in a London jail, and their website has been the target of repeated attacks, they have disseminated their base of operations and cache of materials as to almost guarantee the prevention of any full stoppage. Instead, on the heels of revelations that WikiLeaks has been closely cooperating with major news outlets on when and how to release the cables, Senator Joe Lieberman (I-CT) has called for an investigation into whether the New York Times should be prosecuted for violating the espionage act. "I certainly believe WikiLeaks has violated The Espionage Act. The New York Times has committed at least an act of bad citizenship," Lieberman said in a Fox News interview. "Whether they've committed a crime, I think that bears very intensive inquiry by the Justice Department. Why do you prosecute crimes? Because if you don't, others are going to do it soon and again. And I'm afraid that's what's going to happen here." "What is ultimately the difference between Assange's group obtaining classified documents and Bob Woodward obtaining Stanley McChrystal's secret assessment of the Afghanistan war last year? Or The New York Times exposing George W. Bush's domestic surveillance program in 2004? Or Jack Anderson obtaining classified papers showing a U.S. tilt toward Pakistan in its 1971 war with India?" Politicians and government officials seem to be taking a different tact with this argument, instead implying that Assange and his sympathizers are more like anarchists or, worse, terrorists, than journalists exercising their First Amendment rights. Sen. Diane Feinstein (D-CA) wrote in a Wall Street Journal op-ed, "Mr. Assange claims to be a journalist and would no doubt rely on the First Amendment to defend his actions. But he is no journalist: He is an agitator intent on damaging our government, whose policies he happens to disagree with, regardless of who gets hurt." As the Justice Department continues its investigation into whether it can charge Assange and WikiLeaks with violating the Espionage Act or other laws, only about 1,000 of the alleged 251,287 cables have thus far been published, and they have been redacted to remove some names and sensitive information. The New York Times even asked U.S. officials for advice on redacting documents the newspaper was intending to publish, and were given suggestions, according to an AP report. "The other news organizations supported these redactions," New York Times editor Bill Keller wrote in an online discussion. "WikiLeaks has indicated that it intends to do likewise. And as a matter of news interest, we will watch their website to see what they do." The question becomes then if Lieberman and the Department of Justice follow through with an investigation of the role of the New York Times, and the press at large, in the WikiLeaks affair, how long before Congress calls news editors and publishers before them and demand to know which side they're on?